The Huffington Post is not exactly the best source for Biblical scholarship, and a recent item by David Lose giving four reasons to not "take the Bible literally" is illustrative of why. From the beginning, Lose makes the same error as many of those he criticizes for taking the Bible literally -- namely, he treats "the Bible" as a unified composition. When Lose speaks of taking "the Bible" literally, he falls for the idea that each of the Bible's 66 books is of a single genre and purpose. To that extent, it is not even an operative question to ask, "Should be take the Bible literally?" Rather it should be asked, first, what parts are meant to be taken literally? Then we may ask whether those parts that are meant to be taken literally should be. Lose apparently has no idea about this necessary step. In that light, Lose's four reasons for not reading the Bible literally are already misplaced. But let's have a look at them anyway. 1) Nowhere does the Bible claim to be inerrant. -- To a fair extent this is correct, and Lose does well to note that not even 2 Tim. 3:16 is that strong a passage for the inerrancy doctrine. However, he fails when he says, "one can confess that Scripture is inspired by God without resorting to claims that it contains no factual errors." Although I agree with him that "inspiration" was something closer to what we mean wen we say a work of art is inspired, it is difficult to maintain (unless we are open theists) that God was the inspiration source and yet error was part of that process. In that respect, Lose is no better than the literalists he is criticizing: He sees the matter in black and white, without respect for a mediating position. 2) Reading the Bible literally distorts its witness. -- Meaning what? Lose hauls in a couple of the standard canards (the cleansing of the Temple and the date of Jesus' crucifixion -- issues we have resolved before) and from there proceeds to suggest that there was not an intention to record history, but theology. Now in one sense this is correct, as we have noted in recent replies concerning Norman Geisler: if indeed the intent was not to record history, then it is absurd to demand that a text accord with history. That said, Lose is as uncritical as his literalist counterparts in being too ready and willing to accept that a text isn't meant to record history; or that a text can report theology mutually exclusive of reporting history. As it is, Lose merely pays lip service to such solutions as we propose, claiming that "such an effort distorts their distinct confession of faith by rendering an account of Jesus' life that none of the canonical accounts offers." But that is a contrivance, for two reasons. First, as noted there is no exclusivity between providing a confession of faith and reporting real history. Second, since the Gospels are indeed mere windows onto a much larger and extended history that is not recorded, it is absurd to object that such resolutions produce a history not found in any of the gospels. And so it is, once again, that Lose is no better than the literalists he criticizes, sticking by his guns for his preferred reading of the text while producing lame contrivances as an avoidance tactic to prevent considerations of more sophisticated readings of the text. 3) Most Christians across history have not read the Bible literally. -- This is where Lose's treatment of "the Bible" as a monolith becomes most obviously problematic. He gives examples not of "the Bible" but of one specific story only (eg, Jonah and the whale), which some did not take literally. But beg pardon -- that story is perhaps .02% of what we call "the Bible," and what sort of person thinks that providing one specific and tiny example allows for an extrapolation to a whole? That's right -- the sort of literalists Lose is criticizing. ...literalists unwittingly ascribe to the Bible the status of being "fully human and fully divine" that is normally reserved only for Jesus. Now just repeat that as many times as needed. And that's without divine inspiration. It's rather amusing that Lose closes with an appeal to readers to share "your experience with the Bible and sense of its nature and authority." As if some average, everyday Joe reading the Huffington Post is the best source for deciding what the Bible's "sense of authority" is? Why not instead write to some qualified scholars who understand its social, literary, and historical context? Welcome to the Wikipedia Generation. It's a generation of Lose-ers. 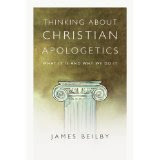 Book Snap: James Beilby's "Thinking About Christian Apologetics"
James Beilby's Thinking About Christian Apologetics is perhaps the most thorough book of its kind that I have seen: An introduction to the history and principles of apologetics, definitions of what it is (and is not), what kinds of apologetics can be done (e.g, evidential, presuppositional), the philosophical basis for apologetics, the Biblical basis for apologetics, and even answers to claims that it is an unbiblical or ineffective practice. To that extent, I'd call this a textbook on apologetics, and while I do not agree with every particular within the book, it's just the sort of thing you will want to read if you think apologetics is something you may want to get into, either as a hobby or as a ministry. Highly recommended. I got an advance copy, but it will be out November 2011. So says Carl Medearis in a blog entry for (CNN), and certainly he's right. He doesn't own Jesus. Jesus owns us. But of course that's not quite what he means either. What he means, as becomes clear further on, is, "No one owns the truth about Jesus." And in that respect, Medearis does not indeed own Jesus, but he does rent Jesus. When someone says something like, "no one owns the truth about Jesus”, it's time to raise the Law of Non-Contradiction again. Because when you say, "no one owns the truth about Jesus," you're making a truth claim about Jesus, and one that is exclusive of all others about Jesus. Which means (gasp) you're claiming to own the truth about Jesus after all. You have to wonder if people in the emergent church have even heard of the Law of Non-Contradiction. But back to Carl. Not surprisingly, it turns out his issue here is more due to rather obvious guilt over having (as he sees it) fouled up as a missionary to Arabs, after having dreamed of being one as a child and having invested much of his adult life in the project. His personal story sounds rather too much like that of fundy atheists who, having once invested their lives in the gospel, now have become anti-evangelists who push Freke and Gandy where before they pushed Hovind and Comfort. As I'm fond of saying, they may change horses, but they wear the same hats. Before, Medearis was a pushy (he says "zealous") missionary who blithely recited the Gospel message to Arabs without caring who he offended. Now he's an emergent who blithely and zealously pushes the emergent message without caring who he offends -- least of all caring about his epistemic consistency. In all this, Medearis has fallen for a partial truth which creates a dichotomy between "religion" and the truth. To be sure, there are forms of religious expression that ought to be avoided, but throwing them all out is a fundamentalist, black and white solution. Though he professes not to be saying "religion" can't ever do good things, his shift to "Jesus" (as he puts it) amounts to having thrown out baby and bathwater together in all else he presents (apart from the lip service....which, one suspects, is calculated to prevent offense to the religious). But as is usual with emergents, the Jesus Medearis preaches is also severely edited -- as best as can be done – and to that extent is the way in which he rents Jesus rather than owning him. Medearis presents the Jesus who fellowshipped with sinners and challenged the religious leaders of the day, while also trying to avoid the Jesus who called the same sinners to repent and called those same religious leaders whitewashed tombs and vipers. He highlights (and does well to highlight) the Jesus who tells the story of the good Samaritan, but deftly avoids the Jesus who ordered the separation and condemnation of the goats. To be sure, this is understandable as a knee-jerk reaction to a completely opposite emphasis which paid more attention to the hellfire Jesus than to the charitable Jesus. It was just such an emphasis which made me despise Christianity for many years. But unlike Medearis and so many others, I kept back the baby when the bathwater was disposed of. The big issue of the day was what to do with all the gentiles that were coming in. Should they "convert to Judaism" by receiving circumcision ... or does God accept them as they are? It was Paul who insisted that it's faith in Jesus that really matters, not converting to a new religion or a new socio-religious identity. Paul challenged me to think of Jesus not as starting a new religion, but as the central figure of a movement that transcends religious distinctions and identities. Jesus the uniter of humanity; not Jesus the divider of humanity. Oh really? Never mind studies such as Segal's Paul the Convert, or Crook's Reconceptualising Conversion, which show that "conversion" was exactly what Paul had in mind (though I do agree it doesn't wholly match modern ideas). Never mind that Jesus hugely divided humans into sheep and goats, and that it was unity in him as covenant broker was what he had in mind (Matthew 10, anyone?). "Where does that leave me today?" Medearis asks. Let me answer that: It leaves him as much in the dark as he used to be before, but on the other side of the spotlight from where he used to be. Q: You say Jesus welcomes everyone, but what about Matthew 25? The rented Jesus of the emergents isn't going to work for anything but a few emotional converts who, like so many today, don't read their Bibles, or else resort (as Medearis does) to the non-explanation of "enigma" to explain the paradoxes and then distract themselves with emotional highs or even charitable service. Saying "Jesus is bigger than any box a religion or philosophy tries to place him in" isn't an answer to such issues but an admission that you don't want to answer and can't. Such cognitive dissonance may be "okay with" Carl -- but it won't be okay with anyone who thinks deeply on the matter and cares about a message that's consistent and believable. In the end, that means long term -- a message like Medearis' will just dig us deeper into the hole we're in. Which is precisely why I won't be letting up on it any time soon. Just recently Norman Geisler issued a second “open letter” to Mike Licona concerning the issue of Matthew 27, and as before, my position is as one who thinks Licona’s final conclusion is incorrect even as I do not consider his methodology incorrect. In that light I will again have much less to say about Geisler’s second false alarm than Licona himself might say in his own defense. Particularly, where Geisler gives six reasons why the text is historical, I won’t be presenting the same answers Licona would. However, I will defend the methodology Licona uses in general principle. Argument one: ….in this very text the resurrection of these saints occurs in direct connection with two other historical events—the death and resurrection of Jesus (vv. 50, 53). Geisler unfortunately does not grasp the absurdity of this “argument by proximity.” It would be as though a politician were delivering a speech on some important local issue (say, clean water) and paused to illustrate with a joke, or some sort of story, and Geisler argued that because the joke or story is told in direct connection with “other real life events,” this means the joke or story was intended to be “real life” as well. Unfortunately, such arguments by proximity are far from sound, especially in dealing with high-context literature. Geisler might object that the politician makes his joke or story obvious, either by noting that he is about to tell a joke, or by a change in tone, or some other means. That would fail him here not only because we are only dealing with a text (and therefore lack aural cues such as a change in tone), but also because as a high context text, Biblical readers (or actually, in most cases, hearers) would be expected to be clued in to what within the text designates it as something other than narrative history. Geisler’s argument is thoroughly graphocentric, and without recognition of the varied ways in which in ancient narrativist might insert non-historical material in a narrative. None of that proves that any particular text is not meant to be taken as narrative history; I am only saying that Geisler has far too simplified a view of the matter, and that his answer is not reflective of the realities of ancient composition techniques. In the case of Matthew 27, I don’t find any clues of non-historicity; though I do find them in another place in Matthew in which Judas is said to have gone and hung himself. The clue there is the clear allusion to the traitor Ahitophel – plus the external clue that Luke reports the death differently. So while I do think Licona is wrong about Matthew 27, it is not because he failed to notice (as Geisler so insultingly implies) that the account of the saints was surrounded by accounts of other historical events. Geisler’s familiarity with ancient literary techniques, especially those of a high context society, simply isn’t broad enough. Even more absurdly, Geisler thinks the use of words like “quake” and “rocks” and “bodies” indicate that the text is historical. This too is a useless criterion, since jokes, legends, and analogies are just as able to use the same words. Again, this does not mean I agree with Licona’s conclusion; it only means that Geisler’s counterargument is invalid. Third, this text lists the same kind of evidence for the resurrection of these saints as is listed elsewhere for Jesus' resurrection:  the tombs were opened;  the tombs were empty;  the dead were raised;  there were physical appearances;  many people saw these resurrected saints (cf. Mt.27; 1 Cor. 15). In brief, if this is not a physical resurrection, then neither was Jesus' resurrection (that preceded and prompted it) a physical resurrection. This fails not only on the same point above, but also fails to recognize that the parallelisms are the product of a text constructed for memory. This in turn means that they do not speak for or against historicity. Indeed, many of these same “evidences” would also be given for the return from the dead of figures like Romulus, Osiris, and other pagan figures. In his own way, Geisler has unwittingly granted credence to those who argue for “pagan copycat” dependencies for the story of Jesus on that of figures like Romulus and Osiris. It might occur to Geisler that these “evidences” are simply what would naturally be expected to be given in a case of a body risen from the dead – just as, in a murder case (whether real life or fictional), we would expect to have as evidence:  a body was found;  a murder weapon was discovered;  the suspect took flight;  there was blood evidence;  there were witnesses to one or more related events. For his fourth point, Geisler quotes Ellicott's Commentary as saying that the brevity and simplicity of the statement in Matthew 27 distinguishes it from legend. I have two comments, one an answer, one an observation. The answer is that Ellicott is wrong: Brevity and simplicity are not suitable criteria for distinguishing legend from fact. The criteria have absolutely nothing to do with one another; it is as easy to sum up a legend in one sentence (“alligators live in that sewer”) as it is to tell it in an hour long story. There are no “typical characteristics” with respect to length when it comes to myths or legends. My observation: Ellicott’s commentary was written in the 1800s. If this is what Geisler takes to be a suitable source for research, as though nothing has happened in the intervening 150 or so years to help us understand the Bible more and better, then we would be far better off if Geisler himself withdrew from making defenses of the Christian faith, for he is making apologists look insensate by using such badly dated (and, yes, wrong) material. The irony is that Geisler will later have some innately disparaging remarks about scholarship, which apparently do not apply as long as you were a scholar who wrote in the 1800s. Geisler’s fifth point is that “some of the elements of this story are confirmed by two other Gospels.” Well, no – the very specific element Licona is discussing is not; in any event, this is yet again the same fallacious “argument by proximity” as in point one. His sixth point is also merely a reformulation of “argument by proximity.” So in the end, Geisler presents only three real arguments. In the end, though, Geisler’s error remains the same: He wrongly assumes that arguing that the Bible reports, eg, something legendary AS LEGEND is the same as saying it is reporting falsehood. This simple point has apparently continued to elude Geisler ever since the time of the similar controversy surrounding Robert Gundry. His complaint of Licona “dehistoricizing” is thus akin to objecting that the same is done when someone argues that proverbs in Proverbs are not absolutes: Whether the text was meant to be taken as history in the first place is the very question that is under consideration. After this, Geisler offers a brief defense of ICBI as the “standard” to follow. I have no horse in that debate, but I find it telling that much of Geisler’s argumentation in this area amounts to “it’s been this way for a long time” and “lots of people accept it,” which are quite obviously bad reasons to accept anything as a standard, regardless of the value of the ICBI as an instrument. If majority rather than sustained argument is to be the measure, then we are better off not being part of an organization like ETS, which ends up being no more than a “good old boy” organization where tyrants and bullies pretend to be deities who whip others into the party line not because of evidence or argument, but just because “that’s the way we do things here.” The very fact that half of Geisler’s “six” arguments are the same, and that all of them are fallacious, is as well reminiscent of how “good old boys” mount their token defenses, intended to do no more than imitate the semblance of a reasoned discourse. In conclusion, Licona has not publically recanted his published view denial of the historicity of the resurrection of the saints in Matthew 27. Until he does so, his view on this matter should be considered unorthodox, non-evangelical, and a dangerous precedent for the rest of evangelicalism. Really now? In reply, I would say: Geisler’s admonition to put “Lordship over scholarship” is fundamentally a case of ostrich action at its finest. Licona is not doing any such thing; rather, Geisler is putting “lordship” (lower case l) over scholarship – which is to say, he is using his bully pulpit to harass, hound, and denigrate Licona and his work, to “lord it over” others in a flagrant abuse of power and influence. For that, he should be ashamed of himself, and no amount of decorating the text with "we love you brother" commentary will change that. The "good old boys" do that too - right before they punch your career or your reputation in the nose. This might all be of no matter if Geisler actually produced some sound arguments for his views, but as happened with Gundry, what was offered was unworthy of serious consideration, which is all the more amazing given that I do, in the end, disagree with Licona’s conclusion. One of our grave mistakes has been maintaining a divide between the academy and the church at large, such that it was apologists like Geisler and Lindsell who became the leaders rather than the apologist-scholars like Licona and Wallace. Of course, not all non-scholar apologists are of that order, but enough of them are – and enough of our leaders are – that this latest situation is an example of our failure coming home to roost. Recently Norman Geisler issued an "open letter" directed to Mike Licona concerning his arguments related to the raising of the saints in Matthew as a non-historical report. There's not a whole lot new for me to say about this in terms of the actual issue, for between my prior review of Licona's book (link below) and my series on Geisler and inerrancy (link also below), there's nothing else I need to say about the issue per se. What I do want to note is Geisler's designation of Licona's view as an "alarming deviation" from inerrancy. Obviously, I don't think it is that at all, but what bothers me is Geisler's heavy-handed and alarmist response to what Licona is saying, and the implied threat his warning indicates. To illustrate the problem, let me draw an analogy to my own past employments. After my work in the Department of Corrections, I spent one year in a public library before turning to full time ministry. This was a sea change in more ways than one. In the DC library, I had over a dozen inmates working directly for me, and hundreds more as "customers". And they had to do everything I told them to. I was also free to tell them when they were wrong -- quite firmly, and with language that brooked no compromise. The public library was entirely the opposite, of course. There the customers were in charge, and no matter how absurd their demands were, I was expected to meet them; no matter how foolish a thing they said, I was expected to nod in agreement. If I didn’t – I risked complaints or even job loss. In practice, though, I frequently didn't just nod in agreement because I couldn't stand not being able to tell the truth. And that gets to the heart of what I have to say today about Geisler's open letter, which is exemplary of a much larger problem we have today, concerning the freedom we need as teachers to tell the truth -- or at the very least (since I do ultimately disagree with why Licona thinks the story is not "straight" history) the freedom to explore options like these. When someone like Geisler issues an "open letter" like this one, it is, in spite of the seemingly cordial language, too obviously an implied threat: Get with the program and reaffirm inerrancy as "we" understand it. Never mind that the very question that needs to be settled first is whether inerrancy as Geisler understands it is even the correct view in the first place; as far as he's concerned, that issue is not open to discussion. And worse, as Geisler puts it, Licona's approach could (gasp) "undermine orthodoxy". Oh really? If it did indeed undermine orthodoxy, and it had been shown to after discussion or debate, yes, that would be a problem. But it does not undermine orthodoxy, and there are arguments to be had as to why it does not – arguments that had already been had when the issue came up with Gundry. Geisler produced thoroughly unsatisfactory responses to Gundry on these points, though of course, I am sure he does not think so. But he is wrong. Geisler emerged from that debate looking like someone quite far in over his head, unable to do more than press a panic button repeatedly. It amounts to a politician using scare tactics like, “This proposal will eliminate Medicaid and Medicare!” in order to frighten needy or elderly voters into turning against some proposed policy change, without thinking rationally about it. The real issue remains the same: Whose views offer the most accurate representation of how to interpret Scripture? In that regard, Geisler cannot, and should not, take the day. We need, rather, to get away from the modernist and Western approach to Scripture he employs, to rescue the text from foreign decontextualizations, and provide a faith that, if not bulletproof, will at least require much more cognitive dissonance and irrationality to abandon than to keep. The time for Geisler's method of treating Scripture has passed. Though in fact, it should never have come to pass in the first place. The Musicians' Gambits -- Phillips, Craig and Dean. These guys are Oneness Pentacostal ministers and there's a lot of concern about that, but as it turns out, you can barely tell it from their music. We need to be more concerned about the bad "too close to God" theology they're pushing instead. Ghosts of End Times Future, Part 4 -- Last of a series on the heresy of full preterism. This time I look at some abuses of the book of Zechariah. Non sequiturs galore again. A Ride in the Reconstruction Zone, Part 2 -- I read half of one of R. J. Rushdoony's monster-sized books for this one (it has 1100 pages) and couldn't find anything that seriously objectionable (except maybe to wimps like the guy in the next entry). The Emergent Gurus, Part 5 -- A new and urgent one this time -- Carl Medearis. I picked up his book The Art of Non-Evangelism and was appalled by what I found. Not that it should surprise us -- Medearis' "just point to Jesus" method of evangelism is just the natural result of us giving too much ground to opponents of the faith long ago. The Elite Set - Is Christianity anti-elitist? Or does it actually have an elitist component?The inspiration for this was a book by Stan Telchin in which he railed against what he perceived as "elitism" in Messianic Judaism. The problem is that what he sounds just like the people who C. S. Lewis referred to who want "democracy" in daily life. Like it or not -- there IS a stratified aspect to the Christian life and our identity in Christ. The past few days I have been reading, and writing an E-Block article on, a book titled Speaking of Jesus: The Art of Non-Evangelism (SOJ) by Carl Medearis. I don't know if Medearis is classed as an emergent, but he does sound like one, and what I found in the book is so appalling that it would be remiss of me to not give it some coverage here as well. SOJ, to be blunt, represents in summary that which is worst in emergent Christianity -- a tragic mix of passive-aggressive arrogance and ignorance posing itself as winsome wisdom while undermining the very foundations of what it professes to believe in. I don't use such harsh rhetoric lightly. SOJ is full of egregious misconceptions in which Christianity is remade into Medearis' image, or rather, the image of pseudo-tolerant and emasculated Christianity into which Medearis has fallen in an effort to avoid offense of others. For today's Ticker entry, though, I will just focus on one misconception, one lying at the heart of the book's title: The idea that first rate evangelism means just "pointing to Jesus." In Medearis' way of thinking, Jesus "is" the Gospel. Semantically, of course, this is nonsense; it is like saying Barack Obama "is" the United States. Jesus is not "the Gospel," but the broker and enactor of the Gospel, and its central personal subject, but to wholly codify Jesus as "the gospel" is woefully incomplete, to say nothing of being without Scriptural or intellectual or epistemic support (apart from it being an emasculated gospel). As Medearis puts it, though: "There is a place for doctrines and dogma and science and history and apologetics, but these things are not Jesus -- they are humanly manufactured attempts to make people think having the right ideas is the same thing as loving and following Jesus." What escapes Medearis here is that without that doctrine, that history, that apologetics, there is no reason to distinguish his "Jesus" from the Jesus who makes Mormon bosoms burn, or from the Jesus who is merely an imaginary friend as the atheists say he is, or the Jesus who is cast as a Hindu avatar who went to India at age 13. The illusion emergents have here is that if they wave "loving and following Jesus" around with a pious flourish, they have dispensed with any priority towards a faith that has epistemic grounding. Like it or not, though, to get to the point where one follows and loves Jesus, one must first contemplate ideas that give way to a decision to follow and love Jesus. Thus even Medearis must have had a "right idea" to get where he is now. His ideas were less substantial, less clear, and far less defining, but he still had them. In SOJ, Medearis' naivete is much like that of the fundamentalist who professes to preach "just the Bible" and gets a bent beak when you suggest that refinement may be had by understanding the linguistic or social context of a passage. Medearis "Jesus" is a decontexualized message rooted in little more than subjective personal experience to which the convert is expected to become addicted under the pretense of it being some sort of "personal relationship". In terms of the specifics of evangelism, he writes, "We don't have to explain [Jesus]. All we have to do is point with our fingers, like the blind man in the book of John, and say, 'There is Jesus. All I know is that He touched me, and where I was once blind, now I see.' "
Perhaps it ought to occur to Medearis that physical blindness being cured is something which is quite plainly evidential in nature; it can be tested, evaluated, and critiqued for effectiveness. On the other hand, his attempt to apply this passage to something internal is entirely misguided: While it can be tested for results, it is incapable of being distinguished, internally, from an artificially bulletproof delusion like the Mormon burning the bosom. The problem though is encapsulated when he says, "we're wrong when we put our faith in our reason." But that's not quite what we're to do. Rather, we're supposed to back our faith (loyalty) with reasons to be loyal. If it were otherwise, the missionary sermons in Acts would hardly appeal to evidence such as the empty tomb. Medearis thinks all we need to do is tell people to "follow Jesus," but without boundaries, which "Jesus" will Medearis be recommending? The one who was the literalization of an initiation symbol in Gnostic mystery rites? The one who was just some average Joe God picked out (adoptionism)? The one who is also the archangel Michael? The one who is the Spirit brother of Lucifer? The shame of SOJ here is that Medearis is believing in his Jesus on the back of his forebears like Athanasius who suffered greatly to be sure that he didn't have to think that hard today. Scripturally, Medearis' one justification for this simple-minded "point to Jesus" routine is 1 Cor. 2, where Paul says he determined to know nothing but Jesus. The fact that a significant portion of the rest of Paul's letters amount to Paul firmly drawing lines between truth and untruth does not occur to Medearis; much less does he realize that Paul's statement is not a full fledged summation of his evangelism procedure, but rather, a reply to opponents in Corinth who valued rhetorical and pneumatic displays over the preaching message. In other words, Paul is pointing to Jesus not as the whole content of the Gospel, but as his source of inspiration and teaching (versus his opponents, who drew on the power of rhetoric and speaking prowess). I knew that I probably didn't need to read [Holding]s article] any further. However, I tried. Like you said, I, too, am willing to be wrong and consider. Reading his website reminded me so much of where I was in 1988 - - confusion! It should disturb us greatly that Medearis' own professions are identical to that of this cult victim. Roger Ebert wasn’t bad as a movie critic, but as a historian and critic of religion, he’s apparently not that up to snuff. I think Ebert needs to check his dictionary: A leading definition of the noun form of “rally” is, “a large gathering of people for a common purpose, especially for some political cause.” Another dictionary adds the qualifier, “A gathering, especially one intended to inspire enthusiasm for a cause.” At best he’s got a bit of that “jack up the spirits” right, but no one seems to think “alarm the other side” is part of the package. In fact, I have to wonder what high school Ebert went to, since as far as I know, no opposing school was ever “alarmed” by a pep rally at the other school – they were too busy having one of their own, as he is compelled to admit (but doesn’t see how that nulls his point). In any event, Ebert is apparently paranoid over Perry’s rally, seeing in it some sort of “horizontal prayer” that is directed at “us” – whoever “us” is. It may well be “paranoid movie critics.” He complains about “eagerness to convert outsiders” which he finds offensive, because “[y]our religion is a matter between you and the god of your definition.” Really? So it’s like a movie you review, in other words? I give Islam 2 stars? There’s no objective truth claims involved? How much do you want to bet Ebert couldn’t so much as lay a finger on the most basic apologetic defense for any spiritual truth claims? How much more you want to bet that’s why he wants to say it’s too personal and you shouldn’t evangelize? He says he wants respect, but if you ask me, I smell a closed mind cowering in fear. The irony is that Ebert himself is showing a distinct lack of respect in his own criticism. In other words, he’s “evangelizing” for his own cause of totally private religion and “respect” for others, in essence showing disrespect for those who don’t agree. He doesn’t like being prayed at, he says, but he expects us to sit still while he preaches at “us”. Sorry, Roger. I give that performance 2 thumbs down. Warren doesn’t really answer the problem of those who have never heard. Instead, he very quickly moves to the topic of getting missions out so those people can be saved. I was pleased to hear that at Saddleback, they have some depth studies, including a 72 week systematic theology course. However, the content of Warren's writings (like PDL) leave me wondering what exactly he considers to be "depth". Further on he makes disparaging remarks to the effect that making Bible study deep doesn't mean explaining the background, it means transforming the student (! ), and implies the former is "muddying" and making Scripture more complex than it needs to be. In a nutshell this is a doctrine of radical perspicuity, and it is harmful in the long run. Depth Bible study should be both transforming and background-explaining; if it is not, the transforming will head in the wrong direction, or be without adequate epistemic support. I fear that, in a manner similar to leaders in the emergent church and many pastors, Warren thinks that if a believer has "passion" that it will be a fuel to sustain them. Well, if they are emotional personality types -- as Warren evidently is -- it might. But that's only serving the extroverted part of the population. In that light it's somewhat tragically ironic that Piper asks Warren to leave a legacy of depth by training pastors. I can only hope that he either doesn't, or that he at least assembles a team that includes Biblical scholars if he does so. In sum: Warren is revealed as a generous (he is a reverse tither) and humble man on a heartfelt mission, but also someone who is, in certain unfortunate critical aspects, clueless -- which is the same impression I got reading PDL years ago. Warren does well to admit he's not as well studied on some issues as he should be, such as prophecy and the afterlife. However, if that is the case, then he is remiss still inasmuch as he continues to speak on such subjects publicly. He may say he is just giving an opinion, but unfortunately, information brokers today have a responsibility to deal with audiences who will jump ahead and take opinion as fact. I am always very careful in this regard for good reason: If I know zero on a subject, I say so -- and only if the other person insists will I deliver what I call a "two cents" opinion, with hard warnings beforehand that that is what is coming. In addition, as a teacher, he does have a responsibility to at the very least refer people to sources for further study. Warren has been too eager to give out answers that he does not have, evidently in an effort to please people. Other criticisms of Warren for not including much of the Gospel in PDL are, I think, justly rebutted by Piper and Warren: PDL was never intended for non-believers, and I know from experience that many people are simply looking for problems. I prefer to concentrate on the real ones. Of particular interest to me is that while Warren does see hell as separation from God, he still holds on to the literal flames. To his credit, he says he doesn't back down from telling people about it. His advice to "lay it on Jesus" though (meaning, in essence, a form of Pascal's Wager) won't do a whole lot of good when you're dealing with most non-believers any more, who will simply respond to his trust in the words of Jesus with their own deferral to the Jesus Seminar or some other popular authority like Ehrman. Our next 2-3 entries will have some commentary on an interview here between Rick Warren and John Piper. Readers may be aware that I am not particularly impressed with either of these men as teachers, and the first 34 minutes of this interview (which is as much as I can stand to listen to online at one time for anything) didn't do much to raise them in my eyes. Warren still sees God in too personal terms (though not as badly as for example, Joyce Meyer!) and Piper is still lacking the anthropological insight to know that Calvinism doesn't cohere with the Scriptures. What has happened here though is that Piper came away from a reading of Purpose-Driven Life impressed by selected statements about the sovereignty of God within, such that he says he doesn't understand the problems people have with it. Well, perhaps I can see why: Piper's own view of God is a bit too personal as well; or at least, it's far enough away from what an agonistic person of the Biblical world would have conceived that it is still uncomfortable. In that respect it is ironic that one point made is that Warren does not trivialize the glory of God by making God too personal -- and yet that is indeed what he does; Piper just doesn't have his own anthropology properly adjusted either. How personal, though? Warren states that it brings glory to God for him to play with grandchildren. Really? I rather doubt that. Understood in terms of Biblical concepts of honor, our human play wouldn't do any such thing; it doesn't hurt God's glory either, of course, but to suggest that it somehow adds to God's glory (honor) is itself quite trivializing -- perhaps even insulting. That's obviously not to say, "don't play with your grandchildren, don't laugh," etc. It's just to say, don't gratuitously add sanctification into occasions where it doesn't exist. One other disturbing point is where Warren says that his hermeneutic does not require him reconciling apparent problems in the Biblical text. Faced with tension, he says, he just believes both. A comment like this would be made worse if Warren had not in the past managed to give apologetics some exposure; but it is bad enough that he says such things as a teacher whose mouth is fixed to so many people's ears. Part 2, and the next 30 or so minutes evaluated, on Wednesday. Tailoring for All Nations? One of KNM's contentions is that an omniscient God ought to have provided a Bible tailored to all nations, cultures, and ages. I will begin by noting that many cultures have an easier time understanding the Bible is they (like the Bible's authors) are agonistic and collectivist -- and that is what 99.9% of people who have ever lived have been. That said, there remain always at the least minor cultural presuppositions that cannot "translate" easily from one age or culture to the next. So should we still expect God to have produced an "omniuse" volume? Not in the least. For one thing, as I have noted many times, such a volume could only be moved in a fleet of vans. Not only so, such a volume would be subject to hazards such as revealing too much about other cultures (or ages) which could readily be taken advantage of by other cultures or prior ages. For example, let us say there was a specially inspired portion of the Bible suited to isolationist Japan in the era spanning from the medieval period to the 1800s. Of course, by KNM's logic, such an inspired section would be useless if it were not clearly identified as being for that specific era and culture. It would have to indicate in some way, "This portion of God's message is for peoples living in the nation known as Japan in years designated 1400-1850 by future methods of reckoning time." Now one can imagine all sorts of mischief afoot in the years prior to 1400. Some wicked person might decide to produce only that section of the Bible, and try to find and reach this "Japan" so they can become rich teaching and preaching to the Japanese. Or someone like Alexander or Julius Caesar or even Constantine might see some advantage in finding or even conquering this "Japan," perceiving from the specially tailored text that it was an isolationist culture that might be subject to certain blandishments -- or might become a threat that needed to be eliminated. The point of this is that glib suggestions of a Bible omni-tailored to each culture and age need much more substance than suggestion. I might add that the very basics of the Bible -- which constitutes a very small portion of it -- are really all that need translation to another culture and age; in this regard our tendency to think the whole Bible is needed -- or none at all -- can be counterproductive. There would certainly be no need to have books like Leviticus and Zephaniah reproduced in an "omni"-Bible. But if the core teaching is so small, then it is no hardship at all to explain it to other cultures as needed, in person. Indeed, this would do far more to increase fellowship and unity in the Body of Christ than plopping a giant "here it is" book down that ends up being full of information useless to the isolationist Japanese -- or even a smaller book with just the core teachings (especially when literacy would not exceed 10% in most nations until the modern era). Beyond this, I would also note that I have challenged KNM repeatedly to show that some real problem with clarity in the Bible exists in the first place -- and this, a serious problem; not merely one where some concentrated work or study is involved, but where a resolution to a critical issue is not able to be found because of lack of clarity. Note as well that "critical" means something essential to salvation -- it seems hardly relevant, for example, if we argue that the Bible is not clear how many horses Solomon owned. That happens to be all I want to say of KNM's arguments for now, but he has promised more when he returns from a vacation in about a week, and we will be answering any more issues here then. Our next few Ticker entries will be devoted to depth analysis of some issues raised in a YouTube exchange with a user designated "KnownNoMore" (KNM). The exchange is too unwieldy to profitably pursue on YT alone, so as is my custom, I am expanding the analysis into one of my written venues. We'll be covering a number of issues that may seem topically disconnected at times, but all of which emerged in the exchange. Is God a teacher? A major point of contention between KNM and I has been his insistence that God ought to play the role of a teacher -- doing such things as answering our questions. But as I have replied, in this and other respects, KMN is indicating a purely modern notion of what a teacher does. 1) The so-called Socratic method. Note that in contrast to what KNM requires, it is not we who would ask questions of God, but if anything, God who would ask questions of us. Though this is reckoned as "guided questioning", it is not the sort of guidance used my modern teachers, and the burden is significantly on the student. In that regard, while the Bible does not use guided questions, it does use other methods just as "direct". The paradoxical nature of Ecclesiastes -- a book filled with statements regarded as being in tension (for example, on one hand mulling over the despair of life, then shortly thereafter encouraging the enjoyment of life) -- has been variously identified as being because Ecclesiastes is either a dialogue of a man debating with himself, "torn between what he cannot help seeing and what he still cannot help believing," [Kidner, Wisdom of Proverbs, Job and Ecclesiastes, 91], or else as the author's "challenge to the man of the world to think his own position through to its bitter end, with a view to seeking something less futile." I prefer the second interpretation, but in either case, the compositional principle is the same, and derives from the ancient Near Eastern methodology, which we might loosely compare to a Hegelian case of combining thesis and antithesis, to arrive at a synthesis; or else, for sports fans, to a game of tennis in which the ball is batted back and forth between opposing points to arrive at a consensus. In this regard Ecclesiastes is related to other ANE literature with the same, or similar, content and methodology. Works like A Dialogue About Human Misery and Pessimistic Dialogue Between Master and Servant (on which, Murphy comments, the "dexterity the slave displays in affirming both the positive and negative aspects of a situation is reminiscent of [Ecclesiastes'] own style" -- Murphy commentary on Eccl, xliii] from Babylon; The Man Who Was Tired of Life from Egypt; and the book of Job from the OT, are all examples of this genre in which problems were discussed and resolved via dialogue. The modern Western mind has little patience with this sort of logical construction, and it is no surprise to see that critics have no appreciation for the implied intent of such literature: "Work out the problem yourselves," vs. "Give me an answer, to go." Though I wrote those words more than 10 years ago, it is still an accurate encapsulation of what KNM thinks ought to be so versus what actually reflects the Bible's method of teaching -- as well as that of far many more educators in history, including some of the wisest and greatest teachers known (like Socrates). In that sense, God has provided only a minimal amount of guidance, as we would reckon guidance -- just as an ancient teacher would: The chief "guidance," apart from presented materials for memory, involves being forced to think for ourselves, look within ourselves, and engage in serious, thoughtful contemplation. KNM replied that he thought Jesus was a teacher, but this too is a category mistake, if by that we mean Jesus taught in a modern way (such as answering questions). Although he did do that for his disciples, he did not teach that way to all people. Most people got a great deal of material to memorize (like his Sermon on the Mount), and were left otherwise with riddles like parables. In other words, the vast majority of people were expected to work with only a minimal, passive amount of guidance – just as is the case today. In the case of Jesus’ disciples like Peter, however, there is a different social rule in play: All others were the “outgroup,” while the disciples were the “ingroup”. Within that inner ring, Jesus would reveal much more, but that is not so much a function of teaching them as it is preparing them to act as brokers for his covenant – which meant, as Jesus himself said, that they were only given more because more because more would be expected of them. Thus the irony: When Skeptics like KNM demand more direct access to God, they’re also demanding that God give them a lot more to do! We’ll have more to say on Friday.